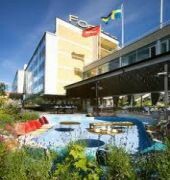 Scandic Foresta offers free Wi-Fi and rooms with flat-screen TVs. Stockholm city centre is 10 minutes%u2019 drive away. All the bright rooms at Scandic Hotel Foresta feature wooden and natural materials. Each is equipped with a work desk. The hotel%u2019s 6th floor restaurant offers lunch in a pleasant atmosphere with panoramic views of the Vartan Strait and Stockholm. The entry level Bistro provides dinner options and drinks can be enjoyed with a newspaper in the Lobby Bar. Guests can work out in the fitness centre or take a walk or fish in the surrounding area. Millesgarden Museum is a 3-minute walk from the hotel. A bus stop with connections to Stockholm city centre is located less than 100 metres away.